For the past few weeks, I have been searching the internet for a way to rebuild the massive blogroll known as the FTW Blogger Group. It is time to admit that I am unable to do it at this point. I have failed, but I am not out. I am going to rebuild the list from the ground up and I need your help to do it. I am going to start over and include only those members who meet the new criteria and want to be in the new roll. The previous list had members who's blogs had been dead for ages, transferred to new listings and all other kinds of problems. These "old" links only bogged down the listing and created a ton of problems when it came to upkeep. The new roll will be listed right over there in the right hand column under the first tab. That way it pops up and can be scrolled through quickly just like before. It's going to have to change if I'm going to make this work. As the previous blogroll grew, it lost it's focus and it lost the purpose it was designed for. The new blogroll will go back to what I wanted it to be in the beginning... a current, friendly 40k blogroll. 1. Your blog needs to be about 40k (the majority of it). We all post about other things, but 40k will have to be the focus of your blog to get listed now. And it's only one blog per member. 2. You'll need to post at least once a month. New and old blogs are welcome. It's simply an aspect I do not believe helps this hobby in any way. 4. Display the FTW Blogger Group logo and consider including From the Warp in your blogroll if you have one on your blog. This is optional, but I appreciate the return exposure. So you meet the criteria, how do you join? 1. Title your email "FTW Blogger Group membership"
2. The link to your 40k blog. That's it, simple as that. I'll email and let you know once you've been added to the new roll. If you'd like to display the logo on your blog to promote each other and the FTW Blogger Group, your support would be greatly appreciated. The image directly above should have a clear background (you can put it over colored backgrounds) that you can copy it for your blog and scale it to any size smaller that fits your page as well. To add the logo to your Blog, just copy the text in the box below and paste it into a HTML widget (for Blogger) on your site. What's going to happen to the previous blogroll? That is a giant list of blogs I look through daily. I'm still in the process of removing the "old" blogs and trying to make it something manageable. It's going to finish it's life in that state. The new list is the one that is going to be much more streamlined and posted here on FTW for everyone to check out. I understand the new criteria may exclude some previous blogs. In order to make FTW the best I can, I need to focus on what this site is about and build it accordingly. There are a number of blogrolls out there that can be joined without these "rules." I'd encourage Bloggers to get their blogs out there and get as much exposure as possible. Just be aware of where you list and the type of community you are trying to build on your own blog. Even more than just getting listed on a blogroll for exposure, I'd encourage folks to get out there and get involved with other 40k bloggers and discussions. Glad to be apart of a positive group. Disappointing, but I suppose there is just too much out there if you don't chose to focus. That's a shame Ron. I think 40k-only is well covered out there so for FTW to be 40k-only also is a missed opportunity to do something different. My blog no longer fits the criteria so I guess that's that. I understand the need to focus and this means change. I know that I will not meet the new requirements. It was a good run and fun while it lasted. Ron, it's a good idea to shake things up sometimes, especially when the status quo becomes a hindrance. FTW blogroll was invaluable to me in the past, and will be again. However, at the risk of being annoying, I'd ask you whether it would be technically possible for you to preserve links to blogs that will not make the cut somewhere, even as a static list, posted once? I'm pretty sure it would be appreciated - but like I said, it's only a suggestion, and depends on a) technical issues and b) time. I'm with The Dark Templar and Drunken Samurai. I just cannot be a GW fanboi anymore, and thus will no longer meet your requirements. So thanks for the good times, I'll remember you fondly! @Fox: I don't think this has to do with fanboyism. Rather its just a reorganization. I find it a bit sad that the focus of the new roll is on a game system and not the hobby of painting toy soldiers. Anyway, your blog, your call. A good idea to clean up the blog-rolls, I've had to do it occasionally myself so understand how difficult it can be to cull blogs from the list. Do what works best for yourself, as ever, your blog is your blog and everything you do for the rest of us really is appreciated and I for one don't take it for granted. wooo hooo! return of the ultimate blogroll! Thanks for making the effort to rebuild! That's certainly a lot of work, and something we shouldn't take for granted! Just sent you my request and would be honoured to become a member of the family, so to speak. Hi Ron, good to know that you're doing that again, I'll email you with my details soon. PS. I've never taken off the FtW logo from my blog since I joined a few years back. I know my blog is not meeting the new criteria, so i'm not asking for membership. But, if you don't mind, i will keep your logo in it. Just consider me as a passive member. Awesome Ron! Glad to see it is back up! First, let me thank everyone for their support. I've received tons of emails covering all aspects and I appreciate folks taking the time to voice their opinions. I appreciate those folks who have voiced their opinions here in the comments and have kept it civilized. I know that the change here is not going to make everyone happy. That is not something I can do no matter how many concessions I make or exceptions. There will always be someone who is not happy with a decision I make. My goal is to make FTW the best it can be and I believe focusing on 40k is the right decision for me. It (40k) is the hobby for me, not other gaming systems or miniatures. Those other systems are no less important, but they are not the focus here on FTW. JasoX: Dead blogs can be determined any number of ways. What constitutes a dead blog can be debated until the cows come home. I've chosen a month as a posting deadline if you will in order to highlight those blogs that are updating regularly. That's not to say those who post less frequently are any less quality. Chicago Terrain Factory: There is a ton of material out there and not focusing on an aspect leads to the issues I had before. 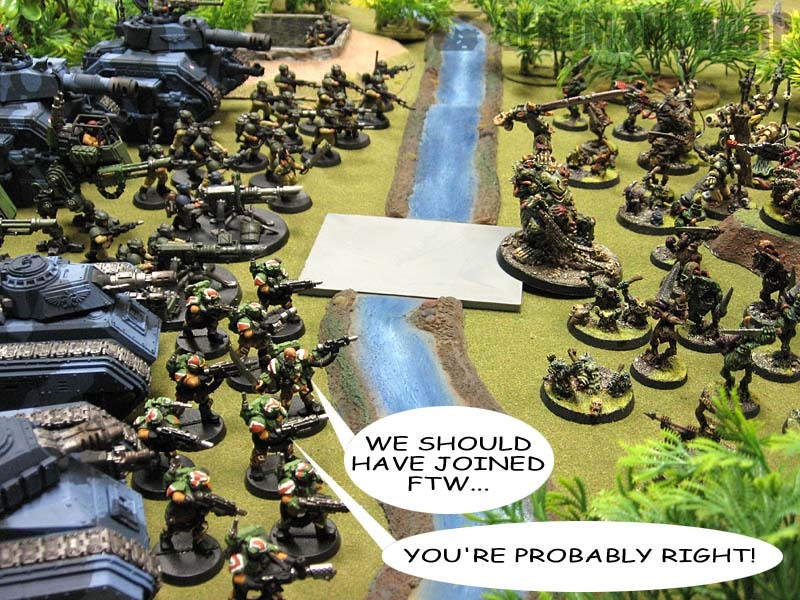 FTW has always focused on 40k, it's the blogrolls that grew trying to cover everything out there. The Dark Templar: 40k is indeed well covered, by lots of blogs, blogrolls, websites, forums... That doesn't mean someone should give up on their new blog because it's 40k and already covered someplace. The FTW Blogger Group is designed to highlight 40k blogs. Marcin Ciszewicz: I have a huge number of blogs in my own reader. How and if they present themselves is a project for another day. FoxPhoenix135: Thank you, I appreciate the support. I'm not asking anyone to be a GW fanboy, I'm going to refocus FTW on what I do with the hobby and that's 40k. Vomkrieg: I understand the frustration and perhaps disappointment that FTW will not cover all gaming systems. The focus on 40k will allow me to bring those particular blogs to the front for folks who are interested in 40k to see. Attempting to cover all gaming systems could be a full time job and I would love for someone to take up the mantle for Fantasy, Warmachine, Hordes, Flames of War and all the other gaming systems out there. Excited to hear about the new version. The old version really helped get my blog exposed as well as introduce me to some fantastic hobby blogs with a lot of valuable information. Thank you for your efforts to bring it back! Many thanks to you Ron! Great to see the return of the FTW group. I post more on the two alternate systems I enjoy in addition to 40k than I used to, but I'm hoping I still qualify with enough 40k content. Even if not, I just wanted to publicly say that the FTW group is a great idea, a huge source of inspiration and a gift of a resource to the community and I'm sure it will continue to be (perhaps even more so) with its refocusing. Thanks Ron! And I want to speak to all the folks who have submitted their blogs and received an email saying I was not going to be including them this time. This is not the end all, be all blog roll. This one is focused on 40k. If your blog focuses on other things, that's perfectly acceptable and I encourage that. There are lots of other great games out there and blog rolls for them. Just because your blog is not included in the visible blog roll here does not mean I am going to stop following you online. I have kept all of the old links in my reader and will continue to follow everyone as I did before... not matter what games you post about. I will still be an avid follower of FTW even though my blog has moved away from 40k and no longer qualifies for inclusion. Your blogroll got me kickstarted back when I first started and I can't thank you enough for that. The Dark Templar And I will follows yours. I still keep track of all the people I did before no matter what blog roll they happen to be on. Well, it's been a good run, but unfortunately I'm on the Privateer bandwagon now, since the 40k scene is nearly non-existent in my area.. and my current Hordebloods project. Good luck! Dave G: And I hope the PP scene serves you well. Sad to hear the 40k scene doesn't exist around you any more. I'll be keeping an eye on what you're up to.